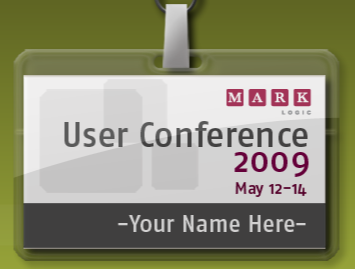 The Mark Logic User Conference is coming up next week. If you're coming to the show, I encourage you to attend the talk on MarkMail I'll be giving on Wednesday. I'll tell the story of MarkMail as it progressed from my first idea to a night project built with Ryan Grimm to the robust web site you see now at markmail.org (and even to the other web sites you don't see, because they're running behind people's firewalls). It's in the conference's technical track so there'll be a lot of focus on the core tech. If you're not coming to the show, why the heck not? :) It's not too late to register.